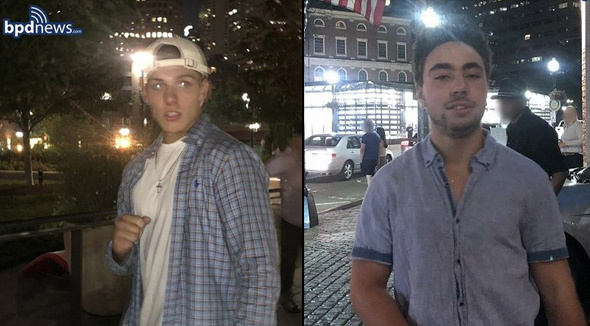 Boston Police report they are looking for these two guys for a beatdown that started around 10:44 p.m. on Aug. 25 the downtown side of Hanover Street, then continued on the Rose Kennedy Greenway before they finally fled. If they look familiar, contact detectives at 617-343-4527 or the anonymous tip line by calling 800-494-TIPS or texting TIP to CRIME (27463). One or both of them are named Chad. See the gold chain? Dead giveaway. That’s all North Shore. They could have come from anywhere, including West of Worcester. Like someone ordered them out of a thugbro catalog. Tough guys Bobby Old Navy and Johnny Eyebrows. They're not having an excellent adventure. How did BPD get those pictures? because it seems that whoever took those photos might know them. Coming to America to commit crimes.